The Community Forest is exactly that… for the community, but also a community effort. Residents and friends near and far each contribute in their own way. One recent thoughtful display of that generosity is the financial gift by Randolph residents Bob and Roberta Potter to cover the purchase of the Rollo Falls property. This tract of 72 acres is now being added to the Randolph Community Forest. 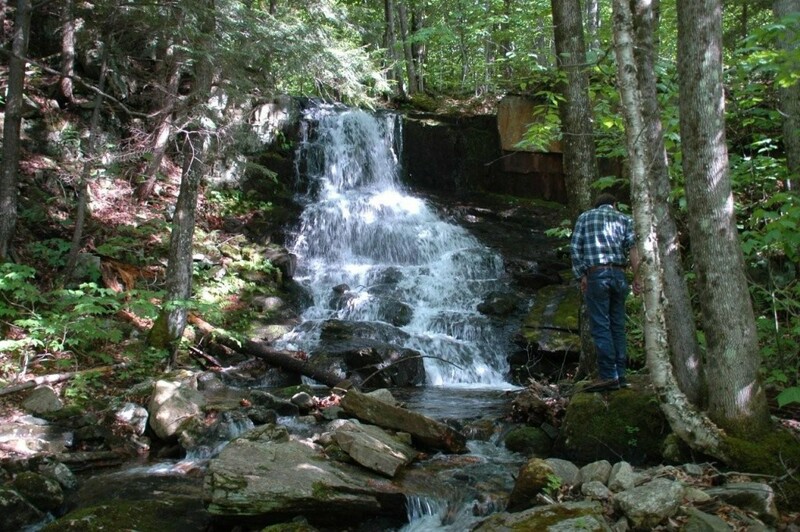 At its last meeting, Forest Commission members took a walk to the falls, along with Bob Potter, to discuss the management of the property. Along for the walk were trails consultant Carl Demrow, who addressed the ability to build a short trail that was compatible with the standards of the Architectural Barriers Act (ABA)— that is, allowing for access by those with mobility impairments. The falls is a beautiful location, just three-quarters of a mile from Bowman Station, and is a great destination for young children or older hikers. ABA trails need to have a minimum width of four feet, with a grade that does not exceed 8.6 percent. During construction, an ABA-grade trail is excavated to below surface organic materials, covered in landscaping fabric, and then topped with gravel. The Forest Commission looks forward to exploring this idea further, and is grateful to Bob and Roberta for their thoughtful gift. Forest Commission members, trails consultant Carl Demrow, and interested residents took a walk to Rollo Falls, recently donated to the town by Bob and Roberta Potter.